A coalition of regional and national conservation organizations and supporters presented more than 22,000 petition signatures and thousands of personal letters to Gov. Andrew Cuomo’s Adirondack Park Agency calling on the agency to protect the Boreas Ponds tract as motor-free wilderness. Public hearings on the state’s land-classification plans for the area have already begun. They will continue through early December. Public comments will be accepted by the Adirondack Park Agency (APA) through Dec. 30. The BeWildNY Coalition is calling for a wilderness (no motors) classification on about two-thirds of the Boreas Ponds tract, with a buffer of wilderness at least one mile wide separating the access road and parking lot from the ponds. The groups also released a new video arguing why the Boreas Ponds tract should be protected from cars, trucks, snowmobiles and other vehicles. The three-minute video is narrated by actress Sigourney Weaver. The music soundtrack was composed by Michael Bacon. Both artists own homes in the Adirondack Park and have been coming to the park since they were children. Both donated their time. In September, the BeWildNY Coalition released a 30-second television commercial featuring Sigourney Weaver. The new version is six times longer, with aerial footage of the ponds and surrounding wild lands in full autumn colors. 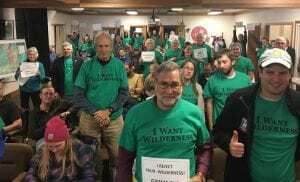 Photo: Wilderness advocates at a recent hearing (provided). Sigourney Weaver’s video is beautiful but it appears a drone was used for some shots which would be illegal in some places. Unless the drone operator had a FAA 107 license, and a clearance from Albany tower to fly over that airspace, it could be an illegal use of commercial video. It does look like some of the video is shot from a helicopter. WOW. This momentum is incredible. Wilderness purists and Wilderness pragmatists seem to be coalescing around their disdain for motorized access. And rightly so. This place is too special. At the hearing I went to, I heard a bunch of people argue, “We paid $14.5 million for this place, so we should be able to access it,” implying that they wont be able to access it unless they can get there in the sitting position. Well, There are more than 9 million people downstate who aren’t within traveling distance of a public hearing, and I think we ALL know what they would say… WILDERNESS. Keep it up Wilderness Advocates! The video is compelling. But I think it is not correct to claim that only a small portion of the Adirondack park is wilderness. 20% of the entire park is Wilderness and almost half of all the public land in the park is designated as wilderness. Wilderness makes up the third largest category of classified land in the park only slightly less than the land classified as Wild Forest (of the 2 public land classifications). Again all these decisions should have been made prior to the land purchase and we could have avoided all this debate. At least the companies making the t shirts are making out well – economic impact! Lest we forget, BP isn’t the entire F-P purchase. Numerous other smaller parcels purchased have been designated NOT Wilderness. I was offered one, but specifically turned it down because it came from BeWildNY. Not my road, not my T-shirt. The green shirts resurfaced at Newcomb, mostly worn by people affiliated with AWA. 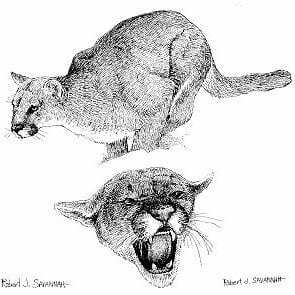 After suggesting that this was hurting our identity, I am told that no AWAer wore a green T shirt at Schroon Lake. But if YOU would like one, you can accompany me to RIT next week, lol! I have no doubt BeWild will be there in force. Where’s the part about all those green T-shirts being bused in at “whose” expense? ?………………..”Big money” and no clue about what’s really happening here……. Wild Forest makes sense, but hey…..where does it say you have to use common sense on the designation of a property riddled with major logging roads and rife with man’s hand prints, tire tracks and others for the past 100 years!